Adding integers just got yummy for spring! 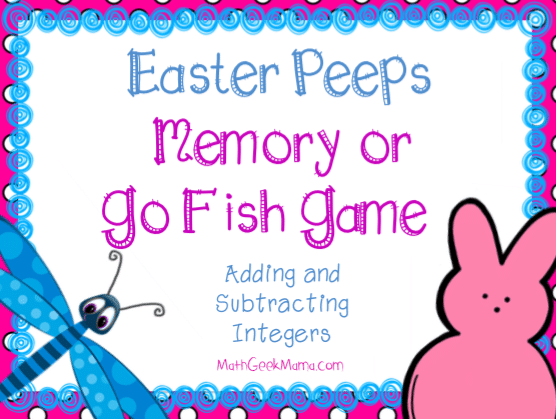 Here is a free printable cool math game for practicing adding integers and for teaching how to subtract integers using Easter peep marshmallows. Since students will already know how to play using the familiar memory game format or using the rules for “Go Fish,” they will be able to focus on the common core standard and practice adding and subtracting integers. Do your students need extra practice adding and subtracting integers? This fun Easter Peeps themed card game from Bethany at Math Geek Mama provides a fun alternative to a worksheet! Simply print the cards on card stock, laminate and cut out! Then they can be used to play “Memory” or “Go Fish.” Adding and subtracting positive and negative numbers can be so challenging – make it fun with this card game! Directions are included.